You may already have read about my liking for Indian food, and one of my favourite ingredients is paneer. This is an Indian cheese which is made from milk and lemon, and thus has the benefit of being 100% vegetarian, which just happens to feature in two Indian dishes that I absolutely love – palak paneer (cheese with spinach) and today’s feature, muttar paneer (cheese with peas). What you’ll notice about making paneer is just how simple it is – milk is soured, the whey drained off, and the curds washed and compressed. This yields a high-protein food, but also something that could lead to a very bland final result. So what to do? Well, the usual solution to any food that seems less than jiggy – cook it with lots of spice! Paneer is best in all manner of well-seasoned, fragrant dishes. I used it recently as a starter – marinated in curry and oil, and then lightly fried on both sides and served with a simple fresh coriander sauce. I suppose you could see this as a more substantial version of tofu, with the final result really being influences on just how you cook it. Muttar paneer is well worth trying. It is one of those really simply cook-it-together-in-one-pan recipes, it is also great when you don’t have much in the store cupboard. You can play fast and loose with the spices, vary how much garlic and ginger you use, go for all fresh or all tinned tomatoes. 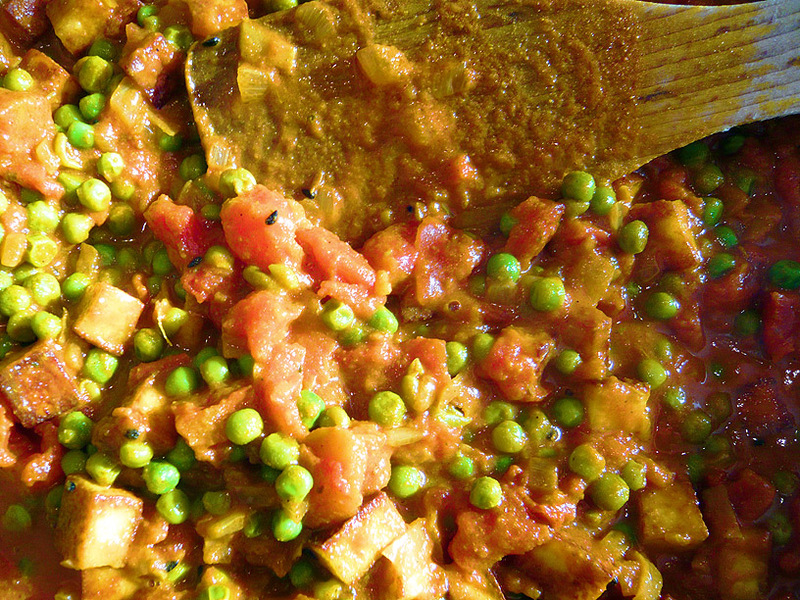 Provided you have the paneer and some frozen peas, you’re sorted. Just make sure you get the spices right – I was always a little scared of putting in too much, but recently I’d been adding more and more, such that I will routinely double or triple the amount in a recipe. If you like it spicy, don’t be scared to be bold. For serving, this is great with a little plain boiled rice, whole-wheat naan or chappatis and a little yoghurt raita, or go for a posh canapé and serve small portions on Chinese soup spoons. Cut the paneer into chunks (as you prefer, I aim for 1 cm cubes). Heat one tablespoon of oil in a frying pan, and cook the paneer until golden all over. It will hiss and crackle with a tendency to jump up and make a bolt for freedom, so keep an eye on it. Once the paneer is cooked, put on a plate and allow to cool. In the same pan, add another tablespoon of oil plus the onion and ginger, and fry gently until the onion is translucent. Add the garlic, cumin seeds and the nigella seeds. Cook gently for a few minutes, being careful not to let the garlic get too dark. Now add another two tablespoons of oil and the ground spices. Fry the spices for a couple of minutes, stirring constantly. Add a glass of water, and the mixture will form a loose paste. Cook on a medium heat until the water in the mixture evaporates and the mixture becomes thicker and oily. At this stage, add the chopped fresh tomatoes, and cook for a few minutes until the tomatoes become soft. Now add the stock cube, the tinned tomatoes, the tomato paste and the cream, and stir well. On a low heat, allow the mixture to cook until the sauce thickens (around 30 minutes – check from time to time and season as preferred with salt and pepper). You can, of course, cook at a higher heat and the sauce will be ready sooner, but the slower cooking will allow the flavours to develop and mingle. Around half-way through the cooking process, add the frozen peas. Add the paneer a few minutes before serving – you only need to warm it through. Serve hot with rice, bread, raita and chutney. Worth making? I really like this recipe and it always works well. 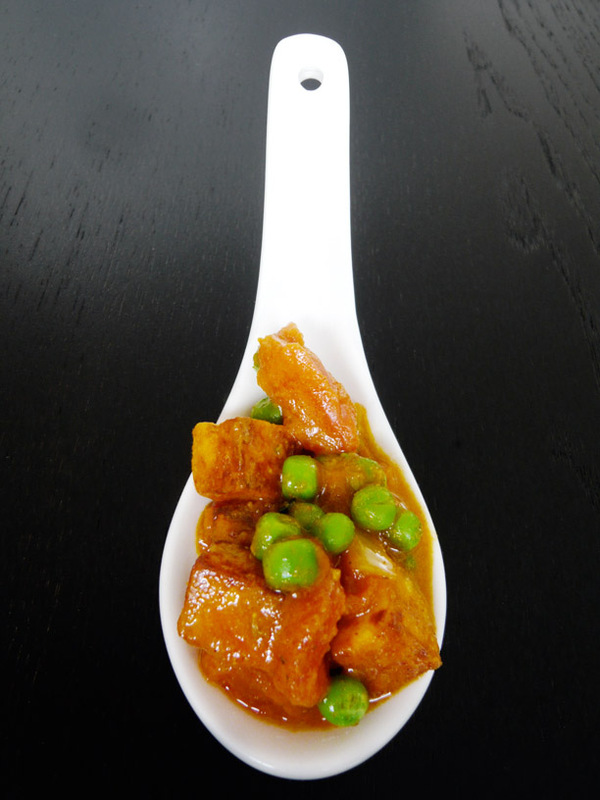 It can also be made ahead of time, and in my view, benefits from being allowed to sit so that the flavours can develop (just don’t add the peas too early – we want them fresh and green, not brown). Also, a word on the spices – really, go with what you want. If you like it spicy or very hot, then feel free to add more than the quantities I have given here. If it does end up too hot, just make sure there is enough cooling raita to solve the problem! You can also substitute sambal sauce with your favourite hotsauce (or omit if you don’t like it too spicy).